Blehm Plastics for over 50 years has been a leader in epoxy chemistries. Known globally for their 5-minute epoxy adhesive and their epoxy 2-part clay, Blehm is continuing their years of success. Blehm became a intregal part of BCC Products in 2007 and is a flagship now among some of the best tooling products in the automotive, foundry, marine and aerospace industries. BCC Products, Inc./Blehm Plastics, makers of BP9024 (one of the first 5-Minute Epoxy Adhesives), announces a new 50ml dual-chamber cartridge packaging for BP9024. Using a standard cartridge gun, the new packaging allows for fast, easy dispensing. BP9024 has been a top-selling epoxy adhesive for over 50 years; it’s used in golf club bonding and general purpose bonding of multiple substrates. BP9024 has been used by professionals in every industry from automotive and aerospace to foundry and marine, and many more. 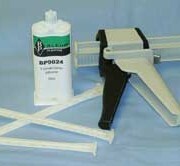 Now with the new 50ml packaging, you can control dispensing and leave a good bead for bonding. Cases of 45 50ml cartridges are available; call 800-556-0067 for more information.